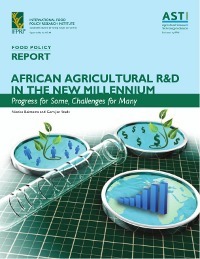 After a decade of stagnation during the 1990s, investments and human resource capacity in public agricultural research and development (R&D) averaged more than 20 percent growth in Sub-Saharan Africa (SSA) during 2001–2008. In 2008, the region spent $1.7 billion on agricultural R&D (in 2005 purchasing power parity dollars)—or $0.8 billion (in 2005 constant US dollars)—and employed more than 12,000 full-time equivalent (FTE) agricultural researchers. Most of this growth, however, occurred in only a handful of countries and was largely the result of increased government commitments to augment incommensurately low salary levels and to rehabilitate neglected infrastructure, often after years of underinvestment. Many countries—particularly those in francophone West Africa, which are threatened by extremely fragile funding systems—face fundamental capacity and investment challenges. National investment levels in such countries have fallen so low as to leave them dangerously dependent on often volatile, external funding sources. Despite the overall capacity growth recorded, average qualification levels have deteriorated in a number of countries. Some reported large influxes of BSc-qualified scientists, often in response to prolonged recruitment restrictions, further straining already inadequate training opportunities and far exceeding the capacity for appropriate oversight and mentorship by senior researchers, given years of nonreplacement of retiring and departing scientists. Notwithstanding the challenges facing many countries, renewed commitment to agricultural R&D by governments and donors indicates improved prospects for agricultural R&D for a number of African countries. Regional initiatives are also a key factor in increasing research coordination and collaboration and ensuring the prioritization and efficiency of research. Increased and sustained investment from national governments, regional and international organizations, and large donors will go a long way toward stabilizing investment and capacity levels and enabling real progress for agricultural R&D in the region. Building on the strategic recommendations of various highly influential reports and meetings, and taking into account the various investment and capacity challenges outlined in this report, four key areas with strong implications for policy must be addressed by governments, donors, and other stakeholders: (1) decades of underinvestment in agricultural R&D; (2) excessive volatility in yearly investment levels; (3) existing and imminent challenges in human resource capacity; and (4) the need to maximize regional and subregional cooperation in agricultural R&D.